1994 Dodge Dakota extended cab headliner repair and installation - guide with pictures. 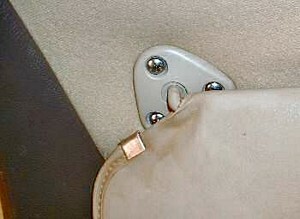 This is a 1994 Dodge Dakota extended cab pickup truck with rips in the headliner cloth. The material has deteriorated due to age and is easily torn. 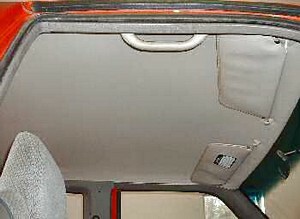 The headliner removal in the Dodge Dakota extended cab and the Dodge Dakota standard cab truck is basically the same, except the extended cab is a little longer. 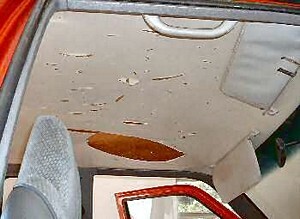 To replace the headliner in this truck involves removing the headliner board, cleaning it and reapplying the material; basically the same procedure as any other automobile. The time required for a job like this is about 45 minutes to an hour and a half, depending upon how handy someone is with with tools. This is a job anyone can do that can loosen a screw, the only special tool needed is a Torx 50 which will fit most seat belt mounting bracket bolts. The extended cab truck kit will fit the Dodge Dakota extended cab truck. 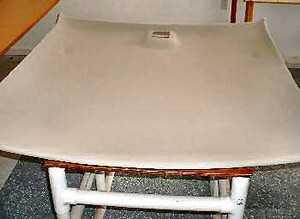 The color of this headliner is 1927 light titanium. 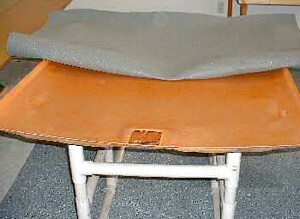 The headliner material has deterioated and has become fragile; it has rotted. Start by removing the visors and anything else that is attached through the headliner board, this is a shot of the handle on the passenger side, remove the plug and use a phillips screwdriver to remove it. Remove the visor screws, remember the approximate position, and using an ice pick or some other sharp instrument, you can find the screw holes once the headliner is recovered and replaced. 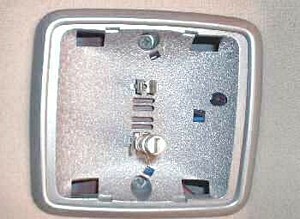 The dome light is held in place with 2 screws, simple to remove. 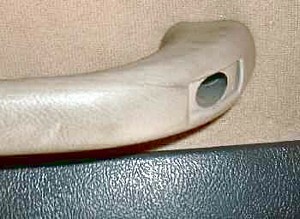 The door post/headliner trim piece is a one piece design. 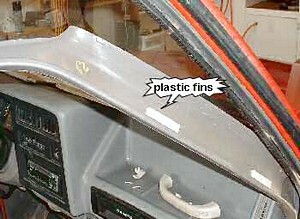 It has plastic fins on the backside that slides into metal clips on the windshield post. It must be pulled from under the rear panel trim and the top rear of the door and then pulled loose from the front clips to be removed. It takes a little finese, but isn't very hard to do. 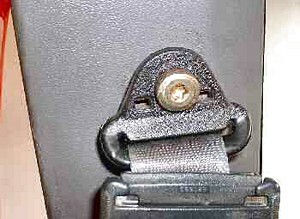 The seat belt bracket on one side, (passenger side may be the best), must be removed so as to allow the rear panel to be pulled down enough to slide the headliner out from under it. Once one side is free, the other side can be pulled out easily. Both brackets can be removed it you want to. 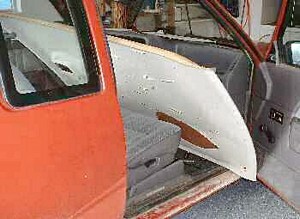 Once free from the trim, slide the headliner board out the passenger side door. Clean the board up with a soft bristled brush. This board is made from soft fiberglass so clean it gently. It has plenty of spine for holding the headliner up, but is also very fragile. Recover the board, one half at a time. Replace the newly covered headliner board back into the truck and replace everything that you took loose, and you have a nicely finished and neat job.